A current-carrying conductor produces a magnetic field around it. A straight current-carrying wire produces a ﻿concentric circular﻿ magnetic field lines around it. The magnetic field is stronger when closer to the wire. Thus, the field lines near the wire are closer together. The direction of magnetic field is again determined by the Right Hand Grip Rule. 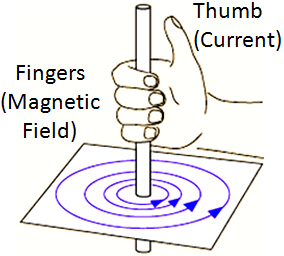 However, now the thumb is the direction of current and ﻿curling fingers ﻿represents the ﻿direction of magnetic field﻿. Note that do not confuse with the Right Hand Grip Rule learnt in Magnetism. Compass D is above the wire. When switch is open, all compasses point to North. When switch is closed, by Right Hand Grip Rule, the compasses point to respective directions as shown. Note that B and C still point to North instead of pointing downwards or upwards as the needle of the compass wont “stand up” in that way as shown.